War…a word that will strike fear into many people’s heart. Ask your granddad on the subject and you will be treated to an hour-long debate on how kids these days are ungrateful little gits and how he fought for us! When the annual England Vs Germany football match comes round, the usual anti-German feeling starts up. Well Take2 have given us a game that lets us take it out on the Germans when we get thrashed 5:0! Hidden and Dangerous is set during the Second World War. You lead a crack group of SAS soldiers and can lead 4 into any mission and chose your team from a possible 40 members. 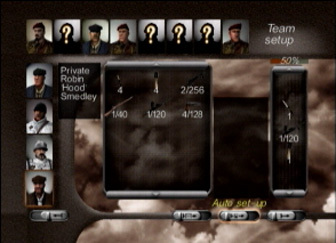 At the beginning of each campaign you will be treated to a very complicated interface identical to the PC version where you have to choose your team and weapons. However, you don't have a mouse and simply pressing the “Auto set up” button seems to be the easy way out! So we eventually get onto the game itself. First, let me make one thing completely clear, this is a strategy game, so none of that charging in guns blazing Quake style! This is a game where you will have to think tactically and work efficiently. You will be treated to a briefing in full 3D at the beginning of each mission telling you exactly what you have to but then you have to get down to the dirty stuff! You can choose between first person or third person perspective views. 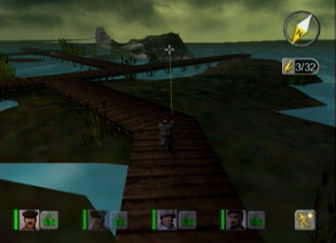 You can control any team member while the Dreamcast will take control of the other three soldiers. The first mission eases you into the game, but you won’t be fighting the Germans the first few times you play this! Instead you will be fighting the controls! On the PC version you had a keyboard and mouse to help you out. Somehow Take2 have managed to implement all the controls using your Dreamcast controller. It takes a few hours to figure out exactly what you’re doing. For instance, if you want a man to run, you hold the “l” trigger and press start. Then you press “Y” to go forward! However, why it seems complicated at first, once you have mastered it you will realise what a great job Take2 have done. It is actually quite simple once you get round the learning part. 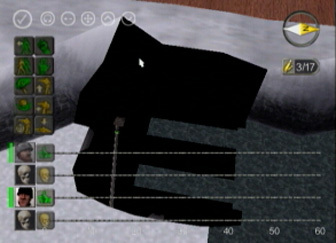 Graphically, Hidden and Dangerous JUST makes it as a Dreamcast game. For example, the first mission is so smooth you won’t believe it. You have to take the bridge in the rain and slowly move your way through neutralising Germans with cover from your snipers. But as the levels get bigger and more graphic intense the game can go at a snails pace. 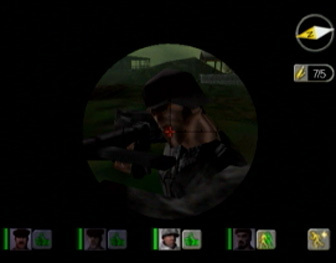 One particular level sees you driving an armoured vehicle. It goes so slow its untrue. To my horror, when I jumped out the vehicle, I found it was quicker walking, yet if you do that you die! The PC version had a lot of bugs and Hidden and Dangerous on the Dreamcast is no exception. You find yourself sneaking up behind a German with your team covering you from all directions. You lie down on the floor ready to roll out from a corner and…wait…where’s my man? Dam…he fell through the floor! He is dead! No fair! Then there will be times when you are running along with your team and suddenly one of your computer-controlled soldiers decides to go off in a different route. Yet you don't realise this until you hear heavy machine gun fire when he has lead the Germans right to your team! The one thing that makes Hidden and Dangerous unique is its strategy, because it actually works. In C:C Red Alert I positioned tanks in certain areas hoping to ambush the enemy when they went down a road, except my tanks just wandered off. Well in Hidden and Dangerous nothing is more pleasurable than placing your sniper on a hill telling him to “hold fire” and positioning your other men to lie down. Then you give the order to “move Out” and you see how your three men run, kneel, shoot, run kneel, shoot while having cover from your unseen sniper on the hill. Another great gaming moment. The satisfaction is brilliant when you see all the dead Germans lying on the floor in an operation that took you 10 minutes to plan but only 30 seconds to pull off. Range of missions is immense because every mission is unique. Sometimes it will be attack a force, clear out trenches, take a prisoner, rescue prisoners, blow up a base or simply hold your position. When completing a mission you look forward to seeing the next one. My particular favourite is a mission where your team is placed in an open field. You have to hold your position until the aeroplane lands at the runway. However, you are under attack from all sides and your team frantically tries to give cover fire while you make it to the plane. A great rush of adrenaline. All in all there are about 40 vehicles for you to control. From cars to boats to planes. Some vehicles have guns mounted on them. Placing your team in say a truck will have two members of your team in front while the other two covering the back shooting at enemies. The AI is actually quite good even though we have already discussed some problems. When firing at the enemy, they will cruel making it harder and his team will run to back him up. Even though your own team can make stupid mistakes they also do fantastic things. The amount of times I was walking down a corridor little realising that a German was positioned at the top of the stairs ready to fire, only to hear the gunfire from my team mates taking him out. It actually feels like a team effort. The sound is good too. Personally I've never been in a war zone, but when a flurry of bullets heads your way you can hear them whip past your ears. Then your team fires back and a full gun battle is in process. It feels like the beginning scene from “Saving Private Ryan”. The music comes in certain places and really adds to the atmosphere. You have your usual weapons like in most war games today. Grenades, types of machine-guns, flares. Its all there and each have there unique sound. You will find yourself knowing exactly what machine gun is being fired at you because of the pitch of sound. The difficulty of Hidden and Dangerous is perfect. It has an excellent learning curve and you will always be replying missions thinking, “did I have to do that, could I of not done it this way?” The replay value is high. Overall, not a bad game at all, it has its new annoying bugs and the control system takes time. But it is so easy to forgive all this when you pull off a great move that even the SAS themselves would be proud of. If you’re into war and like strategy then this is defiantly the game for you. Even if you’re not, then this is still worth a look. 6.5 Could have been better to be honest. When you look at games like Soul Calibur you wonder what their excuse is! Does slow down in places too but the environments are certainly war like. Sound 9 Brilliant. World War 2 in your own bedroom! Fantastic sounds of bullets darting past your head and the screams from your commander saying, “follow me” is just awesome. Gameplay 8 I guarantee you that as soon as you get into this game, you will be staying up many nights fighting the Germans! Its addictive that you will say to yourself, “ill play just one more mission” only to find that you have replayed it 10 times. A lot there. You will be playing this in a few months time still trying to better missions. The game may only take week to complete but then you can easily notch up the difficulty setting.